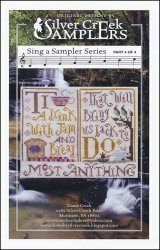 Sing A Sampler Series Part 4 [C6489] - $6.00 : Yarn Tree, Your wholesale source for cross stitch supplies. Cross stitch pattern by Silver Creek Samplers. The verse "Ti, a drink with jam and bread. That will bring us back to do" is accented with jam, bread, and a spring scene. Part four of a four part series. Stitch count for entire series 383 x 73.